From the streets of France to the streets of Brooklyn, Sebastien pushes himself past limits he didn't even know he had. A humorous and poignant autobiographical tale. A love letter to the landscapes and panoramas of New York. And a testament to the triumph of the human spirit. “A delightful visual journey through what it takes to conquer the New York City Marathon." “Outside of Haruki Murakami’s What I Talk About When I Talk About Running, literature and running don’t often go hand in hand, but Samson’s memoir is an affirming love letter to the event and the city around it—and boasts endorsements from several celebrity runners, the New York Road Runners club and the New York Marathon itself." 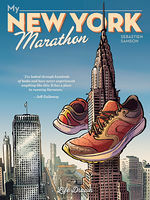 ** STARRED REVIEW** Any New York City marathon represents tens of thousands of stories, but few are as beautifully described or entertainingly told as this one. A must-read for anyone thinking about taking on the challenge. "The story culminates in the marathon, interspersed with a heartfelt N.Y.C. travelogue from a Gallic point of view. Presented in a visual style fusing animation influences and observational realism, Samson’s work is indispensable to marathon runners and those intending to take up the sport." "It’s the New York Marathon as you’ve never seen it."